The drug ice is the chief target in the Dob in a Dealer campaign launched by Crime Stoppers in Queanbeyan on Wednesday. The government-funded national campaign aims to halt the rise of methamphetamine activity across Australia. It is based on the highly successful Crime Stoppers Victoria 2015 initiative, piloted in a several regional and remote centres, which resulted in a 155% increase in community information reports concerning ice. Ice is a stimulant drug that speeds up the messages travelling between the brain and the body. It is a type of methamphetamine, which is generally stronger and more addictive and has more harmful side-effects than the powder form known as speed. The name derives from its appearance; it usually comes as small chunky clear crystals that look like ice. It can also come as white or brownish crystal-like powder with a strong smell and bitter taste. Its other street names include crystal meth, shabu, crystal, glass and shard. “We know that drugs such as ice are of serious concern to the community,” said Crime Stoppers Australia chairman Bryan Roach at the launch in Queanbeyan Park. “Queanbeyan is well aware of the devastating effects of ice so we are asking all residents to help put a stop to the flow of drugs. Halting the spread of ice requires a whole-of-community response and the Dob in a Dealer campaign is specifically aimed at stopping the manufacture and supply of drugs. Crime Stoppers representatives in every state and territory will be working with community leaders and police over the next few months seeking information from the public on those they suspect are involved in the manufacture, trafficking and supply of ice and other illicit drugs. Detective superintendent Rod Smith, the Monaro local area commander, also urged the community to get behind Dob in a Dealer and stem the flow of illicit drugs in the community. “This campaign is about mobilising members of the public in the continued fight against ice in our community,” he said. “Crime Stoppers is committed to working with NSW Police, ACT Policing, the media and local residents to gather information anonymously, which will help keep our community safe, reduce drug supply and drug related crimes. “Time and time again we see the devastating impact prohibited drugs can have, not only on those who choose to consume them, but also on their family, friends and the wider community. “Recent crime statistics – in both regional and metropolitan areas – show the record increase of amphetamine-related offences. If you think you have information about someone in your local community who is manufacturing or supplying illicit drugs, call Crime Stoppers on 1800 333 000 or online at act.crimestoppers.com.au. You can remain anonymous. If you or someone you know is affected by drug use or addiction, please contact support services such as Queanbeyan Drug and Alcohol Services on 1800 809 423. Crime Stoppers is a not-for-profit community organisation, helping to keep families and communities safe. It works closely with police to provide valuable information from the public to help solve crime. Any information you provide is anonymous. 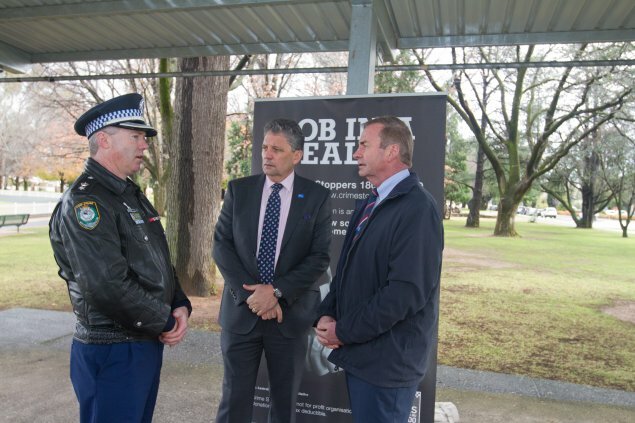 Photo: from left, Monaro local area commander, detective superintendent Rod Smith, Crime Stoppers Australia chairman Bryan Roach, and Queanbeyan mayor Tim Overall. Recidivism rates are very bad, who is to blame for that? The courts for failing to properly punish/rehabilitate the offenders, or the Police for apprehending the offenders after they have been released from custody? Thanks for that, is there an extended report to that? The clearance rate listed was for a 30 day period, what about 60 day period and over 90 days? From looking at media reports most armed robbery’s and indeed burglary’s aren’t put before the courts until up to a year later. When is the offence seen as cleared? When the matter proceeds to court, when the matter is finalised at court or when an offender is identified? The report also shows that ACT Police has the least amount of staff, yet in most instances people feel safer both in their homes and walking the streets at night. I don’t know about calling Police and the incident not being logged, I have heard anecdotal evidence about it, but from asking further questions about the people that have said such things, they have also said that they wanted to remain annonymous and did not want to provide any further information, such as possible offenders etc. How can an incident be raised without sufficient information to adequately send out a patrol car? Is it a suggestion that every call that comes in be raised against their reporting system? Prank calls included? It isn’t the full force of the AFP that Polices Canberra, from the look at those statistics, it is 849 operational Police officers, so about 15% of the AFP Police Canberra. The monthly crime stats they give neighbourhood watch areas (not the quarterly stats ACT Police put on their website) exclude 40% of crimes (they just don’t disclose all burglaries, all car thefts, etc), which makes people feel safer than they should feel. I reckon this is deliberate because the purchase agreement includes a KPI about people’s perceptions of crime, so it suggests the NHW stats are lightened in order to make people feel safer. ACT Police actually refuse to even generate reports and provide incident numbers (thus creating the crime report and the associated stat in the PROMIS database) when people call to report crimes, not just for low level crimes like theft or property damage, but even for illegal shooting in suburban areas. Stop laughing, I’m serious. The ACT has the highest rate of recidivism in Australia (ie, more convicted crims getting out of our failed jail go back to jail than any other jurisdiction in Australia). When coupled with the pathetic clearance rates and the fact than hundreds or thousands of actual crimes are rejected when people call 131 444, it is clear that 2,000 offenders are committing crimes with no effective police force to stop it. The war on terror and subsequent restructuring and resourcing of police forces has seen a huge step-change in law enforcement in all areas, not just CT. Tradecraft and skill sets have been socialised throughout various divisions as people progress their careers and HQ restructures its force allocations. Tech has advanced light years, especially web and SM monitoring. And Canberra is OUR NATION’S CAPITAL. You’d reckon our cops would be extra good to stop criminal elements from taking root, especially organised crime. But instead, we’ve got drive-bys as the east coast war spreads inland. I’ve got to know, what is your major angst against the Police? They can’t be doing to bad, I mean, the prison population is at capacity? Who put all those people there, or did they book themselves in? Why would the Police be using counter terrorism money on bikies? Isn’t the ACT Labor party trying to bring in laws to help combat them, but the hippies are opposing them? In a previous post you stated that ACT Police has the lowest clearance rate in the country, where can I find at these figures, they genuinely interest me.